You will be picked up at the hotel and depart for Tsavo East by 0600hrs. We will drive along the main Mombasa - Nairobi highway. We will have a short break around 0900hrs thereafter we will enter "the theatre of dreams" also known as Tsavo East home of the red elephants by 1000hrs from Bachuma gate. We will have a game drive en route to the lodge for lunch and check in. After lunch you can relax in the lodge until 1600hrs when we will go for our evening game drive searching for the animals until 1800hrs when we return to the lodge for dinner and over night. After breakfast, we check out of the lodge by 0800hrs and have a game drive while we are exiting the park at the Voi Gate. There after we make our way to the scenic Taita Hills. We are expected at the lodge by 1200hrs in time for lunch and check in. Taita hills is home to over 400 species of birds and 4 of the 5 big five the only one missing here is the rhino. After lunch, you can relax in the lodge and enjoy the beautiful scenery here until 1600hrs when after we have our afternoon tea we head out in search for the animals and birdlife available in this park. At 1800hrs we make our way back to the lodge for dinner and overnight. "The early bird catches the worm" we put this old saying to the test and head out for an early morning game drive after a cup of coffee at 0600hrs. We will search this sanctuary for its birdlife and wildlife against the backdrop of the African sunrise. We will return to the lodge by 0800hrs for a full breakfast. After break fast we can head out for another short game drive if you wish until 1200hrs when we return to the lodge for lunch. After lunch you can relax in the lodge and enjoy the beautiful scenery here until 1600hrs when after we have our afternoon tea we head out in search for the animals and birdlife available in this park. At 1800hrs we make our way back to the lodge for dinner and overnight. After breakfast, we check out of the lodge by 0730hrs and have a short game drive while we exit the park. Thereafter we will make our way to the Maktau gate of Tsavo West and enter the park and have a game drive en route to the lodge for check in and lunch we are expected at the lodge by 1300hrs. 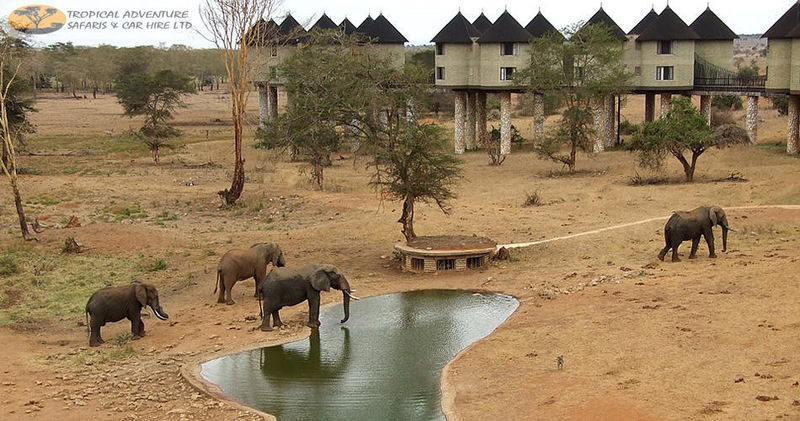 Tsavo West is known as the land of lions and lava and you can see this in the beautiful volcanic terrain there. After lunch you relax in the lodge until 1530hrs when we will either visit the rhino sanctuary which is located inside the park or visit Mzima springs which are an oasis in a desert like an environment this depends on which lodge you choose. Thereafter we continue with game drive returning to the lodge by 1800hrs for dinner and overnight. After breakfast, we check out by 0700hrs and have a game drive while we exit the park. Thereafter we join the main Mombasa - Nairobi highway and make our way to Nairobi. We are expected in Nairobi by 1500hrs and you will be dropped off at the hotel. You have the rest of the day at leisure. Please note that in Nairobi you are on Bed and breakfast so any meals you have in the hotel you will pay them directly. Thereafter overnight. After breakfast, you check out ( depending on your flight) and we will pick you up and transfer you to the Airport for your flight back home.